Here’s a free days of the week printable you can print and colour, plus ideas on how to use it with your children to learn the days of the week. See my full Rainbow Discover Zone here. 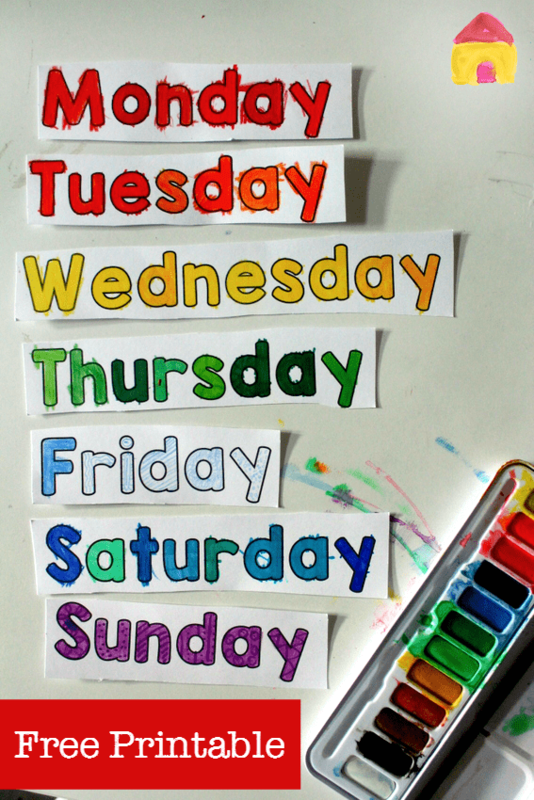 We’re working on learning to spell the days of the week at the moment and I know my children learn best when we include some colour and fun. We’re also all about rainbows right now, and the seven rainbow colours matched with the seven days of the week is such a perfect combo. I’ve also got a girl who loves colouring in. Put all three together and we came up with this rainbow days of the week spinner! The printable is in an open font, so you can colour, paint or pattern the letters in. Adding colour to spelling is great for visual learners, and as you fill in the letters you are working on the shape and order of the letters in each word. I’ve also included some ‘today is’, ‘yesterday was’, ‘tomorrow is’ cards in the printable, so you can talk about past, present and future. :: We’re tracing over each letter with our finger, learning the feel of the shape of the words. I might add a raised layer of glitter glue or yarn on each letter to given even more tactile input. 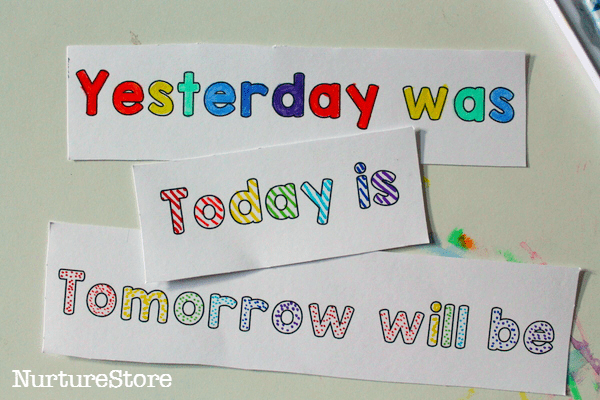 :: You can add magnets on to the back of each word and use them on a magnetic board or fridge door. Jumble them up each day and ask your child to unscramble them in order, starting with whatever day today is. 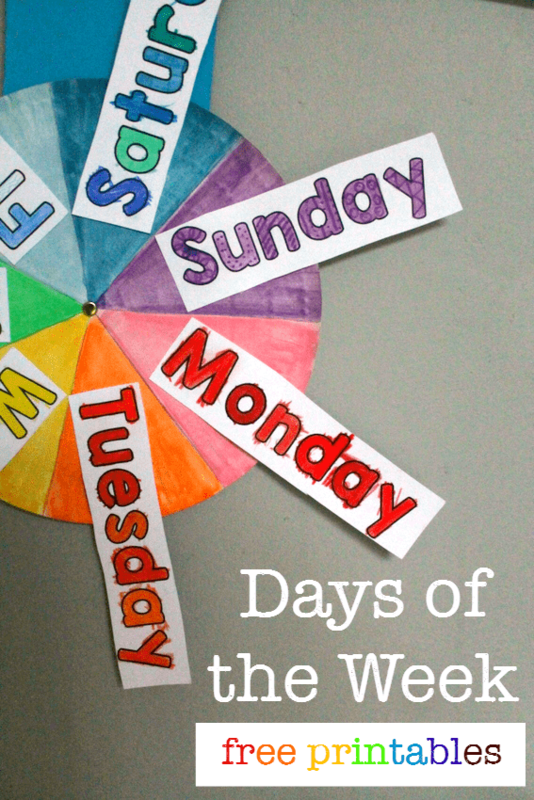 :: Or you can make a super deluxe, mega fantastic Days of the Week Spinner! 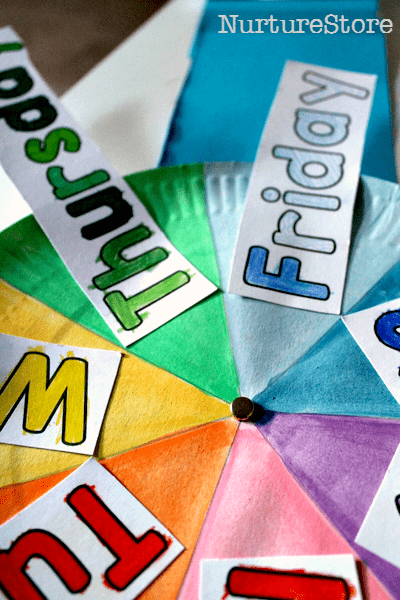 To animate your days of the week, for a bit of fun, you can make a simple spinner. Take a paper plate and split it into seven sections (51 and half degrees each-ish). Then paint them the colours of the rainbow, to match your days of the week cards. Stick each word card to the matching section on your paper plate. 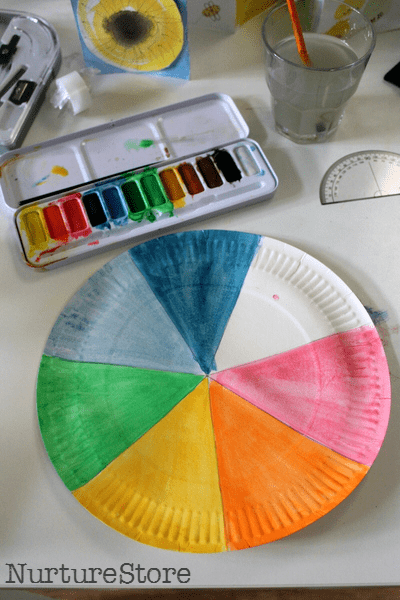 A split pin/paper fastener in the centre lets you fix your paper plate to a piece of card and, hey presto!, you have a super duper rainbow spinner! 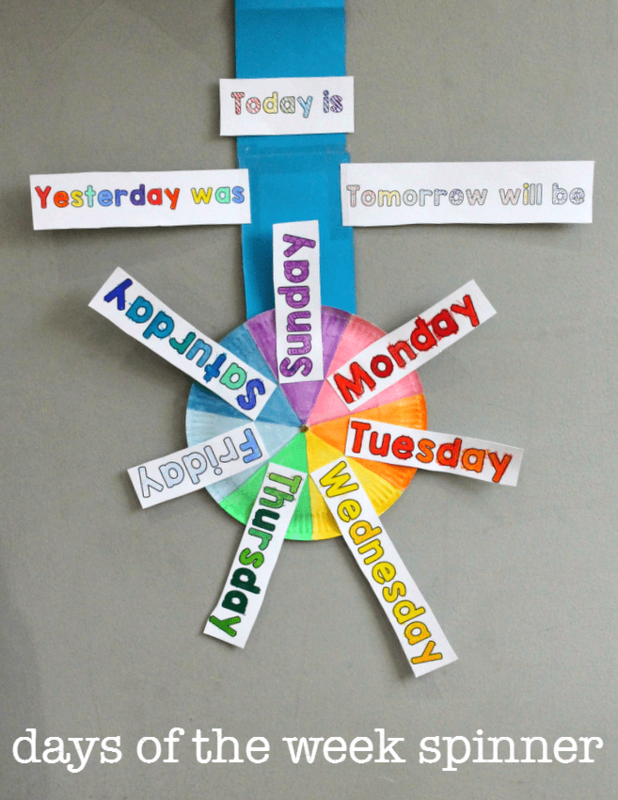 Add your ‘today is’, ‘tomorrow is’ and ‘yesterday was’ cards and you can spin the wheel each day to add a little pizazz to your learning. Thank you this is exactly what I was looking for my son. It will be so helpful! Great! Glad it was useful. It really helps for my children to do project work in the school. 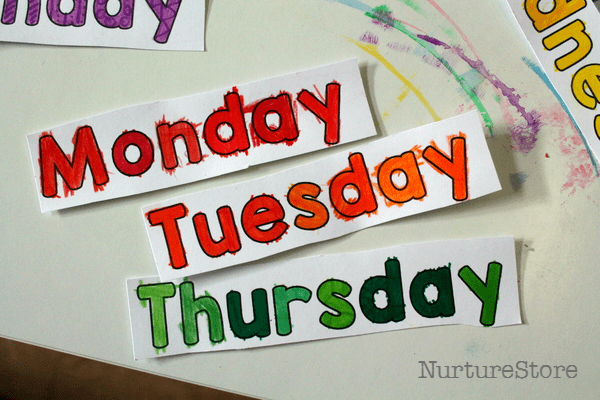 I’ve been teaching my class days of the week for a month now and they are still confused as to what is tomorrow and what it was yesterday – this idea is absolutely perfect!!! I’m going to get the kids to colour it all in tomorrow 🙂 Thanks!